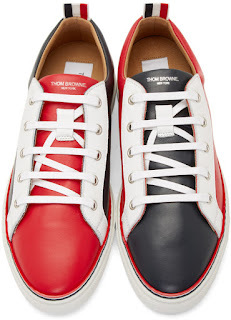 Would it really be Thom Browne if it wasn't a wee bit cheeky? These Tricolor Leather Low-Tops Sneakers are a whimsical nicely executed low-top for the late summer early Fall season. 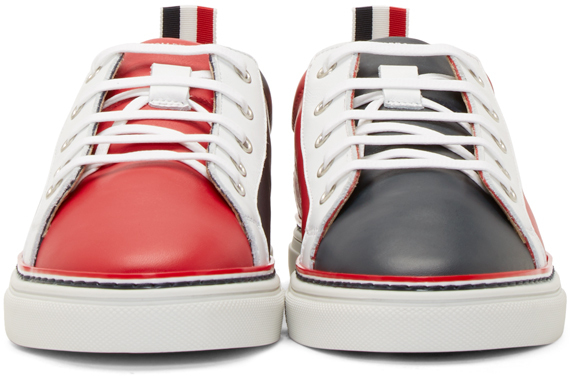 The upper is premium leather and features reverse color blocking on each foot in classic red, white and navy blue. Tiny standout details like the navy stitch, subtle red piping and sliver of white sole sandwiched in between all above the white sole not only reinforce the theme but make this one superbly done sneaker. Available now at Ssense.com.